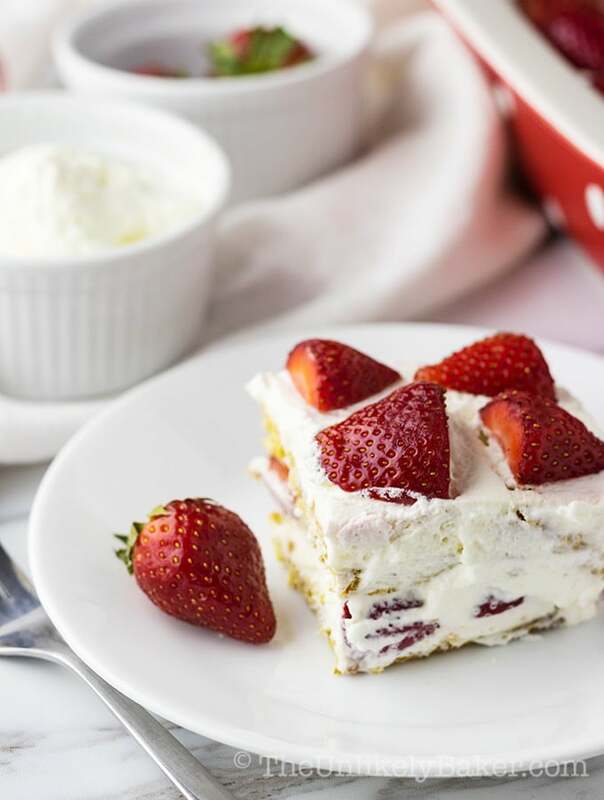 This strawberry refrigerator cake (or the Filipino version of strawberry icebox cake) has a secret ingredient – condensed milk! It’s sweet, creamy and perfect on a warm sunny day. Refrigerator cakes or icebox cakes have been around for a long time, probably since refrigerators were invented! It’s so easy to make, can be made days ahead and always a crowd pleaser. Really, what’s not to love? Cookies sandwiched between luscious cream topped with fruits or chocolate or whatever you fancy. This is my mom’s recipe though she usually makes her fridge cakes with mangoes (fun fact of the day: Philippine mangoes are the best in the world). But strawberries work too. Or whatever fruit happens to be in season. There is an abundance of strawberries now so strawberry refrigerator cake it is. My mom’s recipe had a layer of graham cracker crumbs mixed with melted butter but after making this cake countless times, I’ve found that I preferred using whole graham cracker cookies. Less work but just as delicious. So I updated the recipe and simplified it. Then chill overnight. Easy peasy right? Watch the video to see how easy! Seriously, the hardest part is always the waiting. You also have the option of making parfaits or trifles instead of cakes. Saves you the trouble of getting perfect slices. But you do need to crush the graham crackers. The assembly is similar – start with graham cracker crumbs, followed by cream and end with strawberries. These single-serve desserts are perfect for company! if you’re taking this to a BBQ or potluck. Refrigerator cakes are one of the easiest desserts to make. And they’re delicious too! 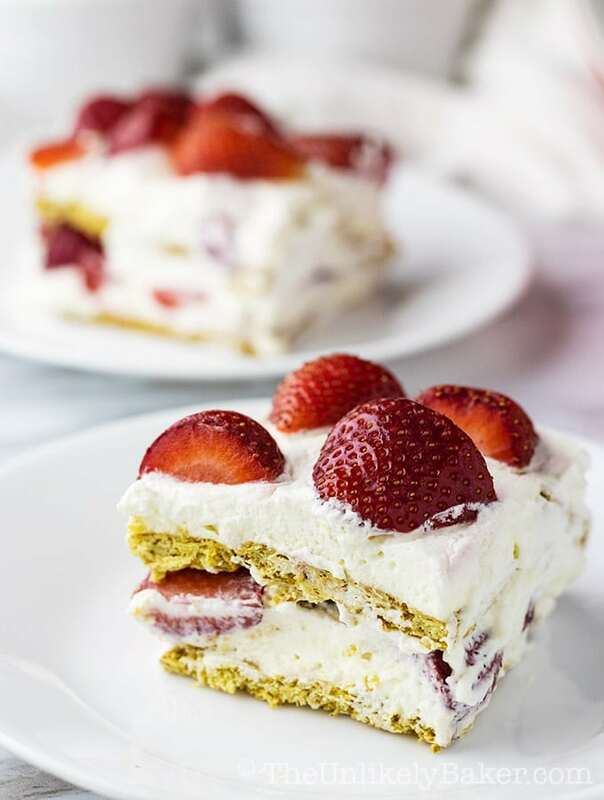 Here are some tips and hacks so you can make perfect no bake strawberry icebox cake recipes every time. Unlike the typical icebox cake, the Filipino version is sweeter and made with (what I think should be the national dairy – we put it on everything) condensed milk. How much you use depends on how sweet your strawberries are. Start with a tablespoon and taste. And keep adding a tablespoon at a time until you get the sweetness you like. I personally won’t go more than 1/2 cup condensed milk (and that’s already plenty sweet); you want the strawberries to shine through. More than that and all you’ll taste is condensed milk. This strawberry refrigerator cake works best with sweet strawberries so try and get the best of the season. Like I said, I make sure to use the freshest, sweetest strawberries I can find. Sometimes, life happens though and I need to delay my sweet plans for a few days. It’s horrible to see my once-gorgeous strawberries start to look sad after a few days…until I discovered this great new hack to make them last longer! I wash them with a water and vinegar mixture. Seriously. Read all about it here. Can I use frozen strawberries to make refrigerator cake? 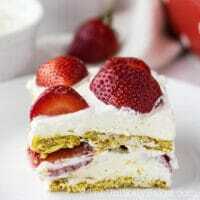 When making strawberry refrigerator cake or any kind of icebox cake, use fresh fruit as much as possible. Frozen fruit has too much moisture in them and you don’t want all that extra water seeping into your beautiful cake. If fresh fruit is not an option, try canned, like peaches. I used fresh peaches for this no bake fresh peach icebox cake but it can be made with canned peaches if fresh peaches are not in season. Just make sure to drain properly and remember that canned fruit is already swimming in sweet syrup. Adjust the recipe accordingly. Can I use Cool Whip to make this icebox cake recipe? 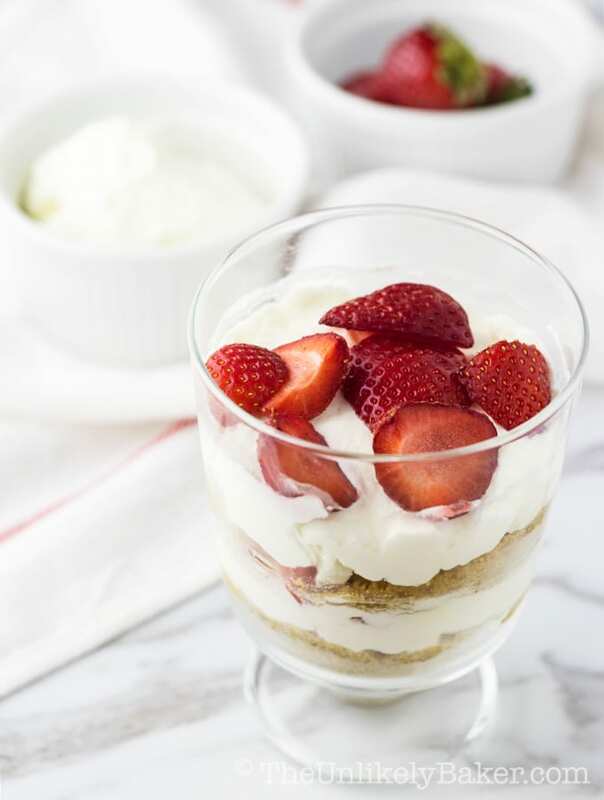 Yes, you can use Cool Whip to make this delightful strawberry graham cracker dessert. I personally like the taste and texture of homemade whipped cream though so I always make my own. If you have 15 minutes you can make your own whipped cream too! Just take heavy cream and whip stiff. You’re done! Hope you try it. Is it better to freeze or chill strawberry refrigerator cake? I usually just chill my refrigerator cakes in the fridge overnight. When I’m ready to serve, I just bring the cake out and slice. The cake slices are not perfect but the cake is creamy and delicious. However, feel free to freeze them. Just note that if you do: treat it like how you would ice cream cake – thaw a little before serving. And note that the fruit will be frozen too. So take advantage of all these beautiful strawberries. 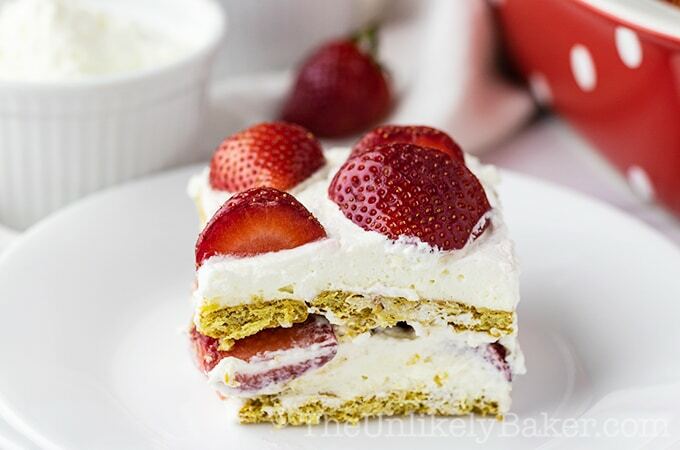 Make a strawberry refrigerator cake! It’s simple, quick, easy and so good. Perfect way to welcome this glorious warmer weather. And a refreshing cake to prepare for Mother’s Day too. Strawberries are available year round but they’re the most scrumptious from late spring to early summer. 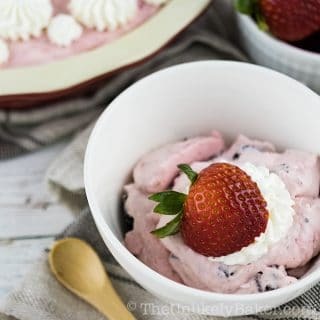 Let’s go strawberry-crazy and make these other no bake strawberry desserts. This creamy fresh strawberry cheesecake mouse is dreamy and so luxurious. 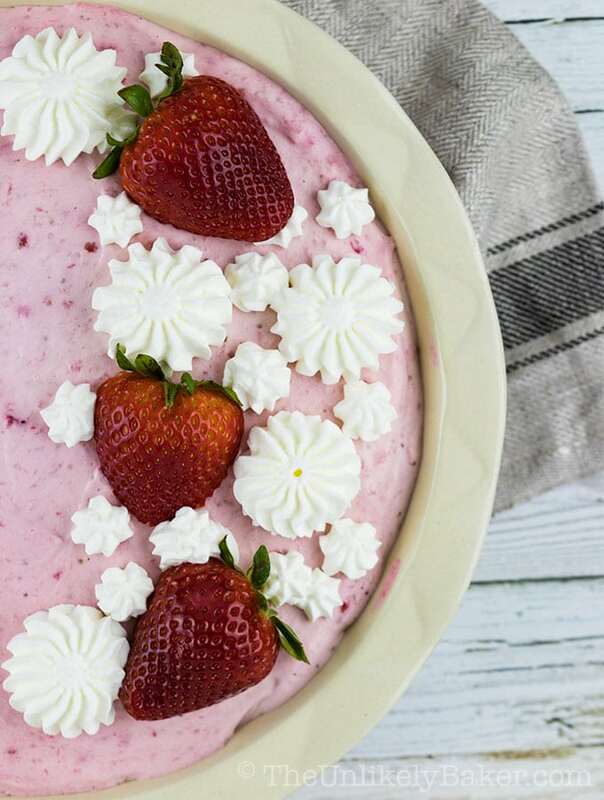 Strawberry mousse sits on an Oreo crust; every bite is so refreshing! 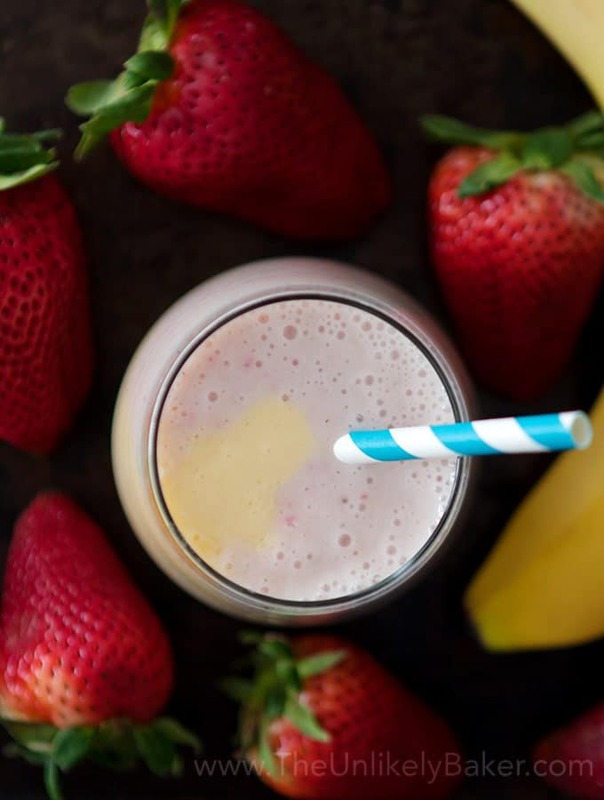 All you need is a blender to enjoy this strawberry mango banana smoothie. It’s sure to cool you down on a hot summer day! Want to start the day extra special? 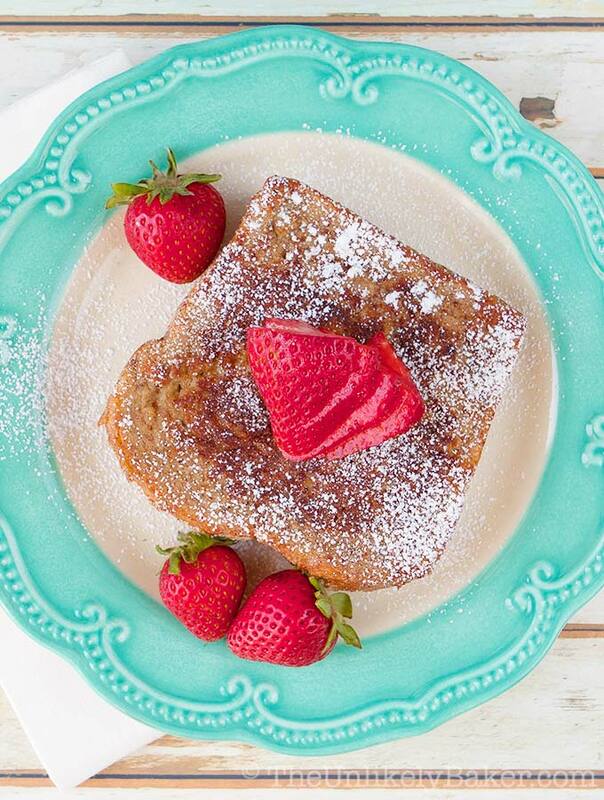 Make some delicious strawberry cream cheese stuffed french toast. Might just make a morning person out of you. 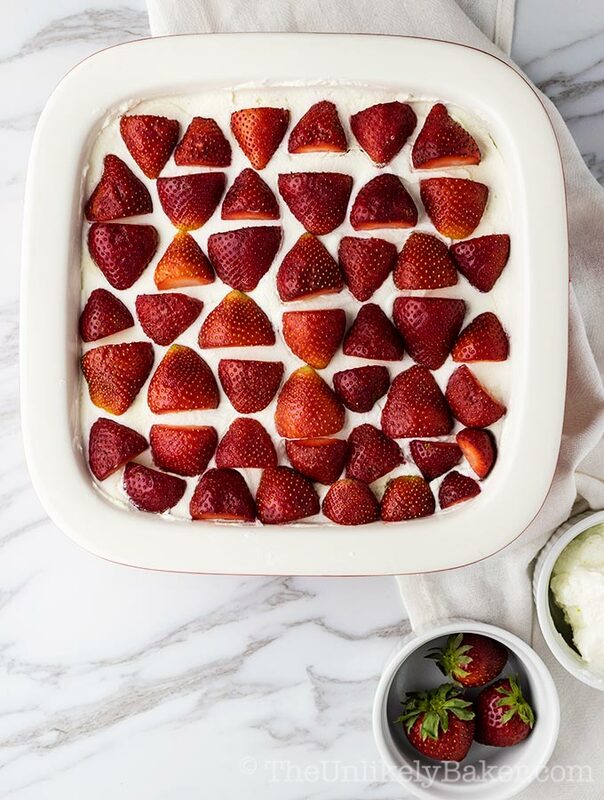 This strawberry refrigerator cake (or the Filipino version of strawberry icebox cake) is sweet, creamy and perfect on a warm sunny day. 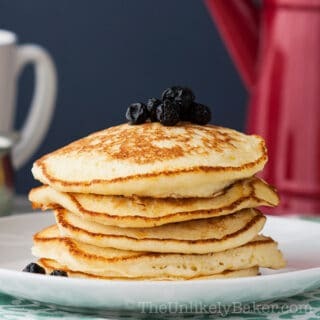 Using a handheld electric mixer or a stand mixer fitted with the whisk attachment, whip 2 cups of heavy cream on medium-high speed until medium peaks. 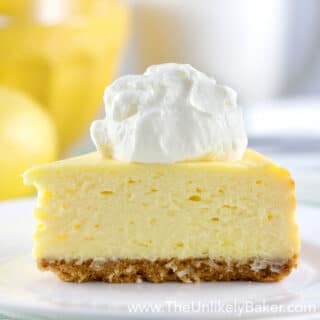 Switch to low-medium speed and drizzle the condensed milk 1 tablespoon at a time. Add more until you get the sweetness you want. Once you're satisfied, switch back to medium-high speed and beat until smooth and stiff. Place a layer of graham crackers at the bottom of a deep 8x8 baking dish. Evenly spread a heaping cup of cream on top of your graham crackers. Then put a layer of sliced strawberries on top of that. 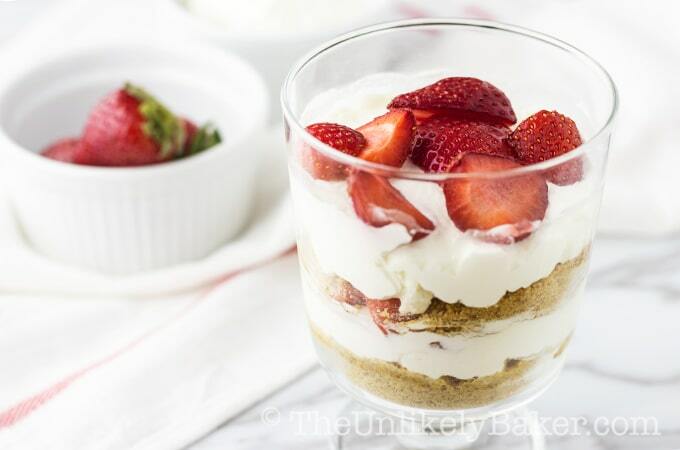 Repeat by covering the strawberries with graham cracker cookies. Be sure to cover the entire layer; cut the cookies to fit. Then cover with another layer of cream and top with strawberries. You now have two options: you can either (1) freeze or (2) chill the cake in the fridge overnight. Freezing will result to a more ice cream cake-like end product which you would have to thaw several minutes before serving. Chilling will result to a creamy, ready-to-eat cake out of the fridge (see notes). Tip for whipping the cream - put the bowl and the whisk you're going to use in the fridge for about 15 minutes before you plan to start whipping. This way your cream stays cold longer and easier to work with. How much condensed milk you use depends largely on how sweet your strawberries are and how sweet you want your cake to be. Adjust to taste. The graham crackers I use are squares (see video). I used a total of 21 cookies to fill my 8x8 inch baking dish. If you choose to freeze the cake: treat it like how you would ice cream cake - thaw before serving. And note that the fruit will be frozen too. Did you make strawberry refrigerator cake? I’d love to hear from you in the comments section below. I love this stunning cake!!! It perfectly fit for summer days!!!! Gosh this looks delicious! I can’t wait to try it, I have never had anything like this before! Thank you for sharing. Hi Cally! This is a great way to take advantage of all the gorgeous strawberries available now 🙂 Hope you enjoy it when you decide to try. Have a good evening! Looks very tasty. 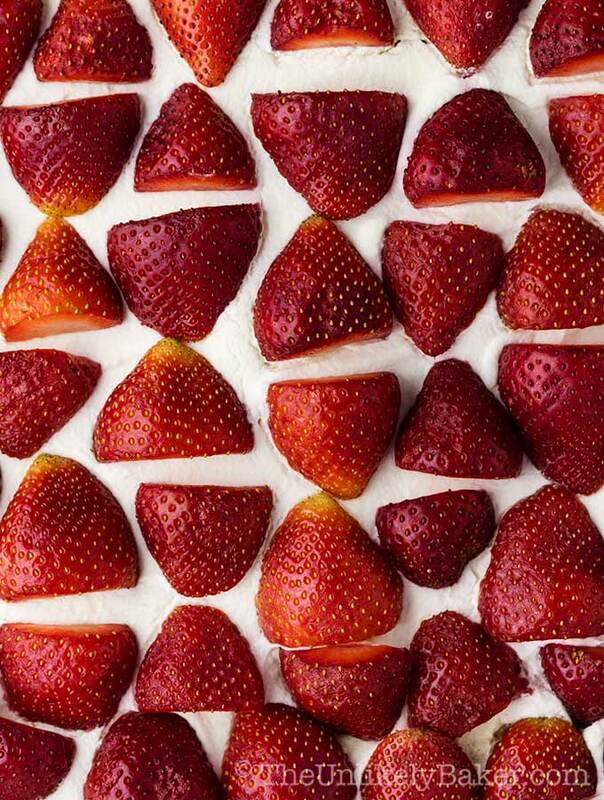 I have done this with bananas but never thought of trying strawberries. Awesome idea! And they wouldn’t even be able to tell it’s the easiest dessert in the world to make 🙂 Enjoy! 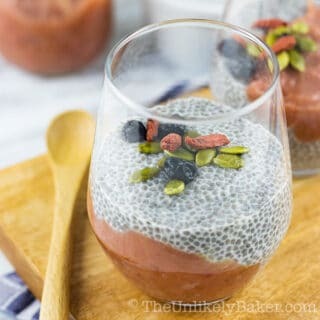 Wow this looks AH-MAZING! I love any dessert that has strawberries. 🙂 Will be pinning this. It’s been so nice and lovely out 🙂 Let me know how goes if you do end up trying it. Yum! This looks like the best ever!! Perfect for the spring and summer. Absolutely! It’s cool and light and refreshing. Thanks Christine! The individual servings are the cutest!! Either way, this recipe looks delicious, I am a sucker for anything with graham crackers. Can’t wait to try this one. Excellent! Single-serve looks so cute 🙂 From today as many strawberries, the off-season the same kind? I don’t know ice box cakes, so both versions are new to me. But I love yours! I can imagine how good it must taste also with mango..mmm.. Perfect in the summer when we don’t want to turn the oven on 😉 . Oh I need this cake right now. Strawberries are my favorite! 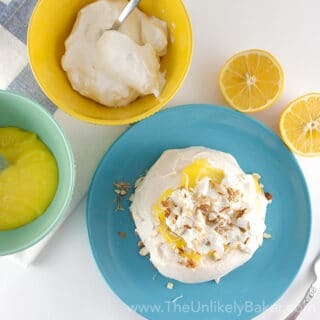 I love recipes like this for the summer! A delicious cake without turning the oven on! Absolutely! I have a little (teeny-tiny) kitchen and it can get pretty hot in there. Fresh local strawberries are right around the corner for me! I can’t wait to get my hands on them so I can try this recipe! Whoa!! This looks to DIE for! The textures! Amazing photos- they make me really want to make this. 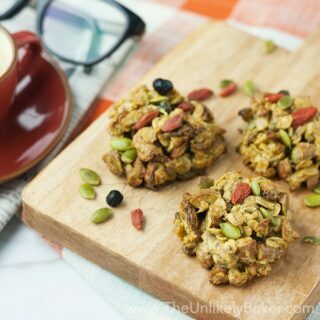 Added to my yummly and my pinterest!! Love that you can change up the fruit. Simple and easy to make. Yup it’s very versatile. I would stick to soft fruit though (does that make sense? I don’t think apples will work for example because the cream won’t be enough to soften it). Anyway, I’m all for experimenting 🙂 Thanks for passing by Candy! This literally is the definition of a summer dessert! Looks delicious! Wow this looks amazing. I have never made an ice box cake and this looks easy. And so true dont Jinx weather, the same goes true for Michigan the moment you think its perfect it will do a 180 degree turn on you. Ohhh, I love a cake like this! Looks very tasty with the strawberries, would be perfect to have a slice in the Spring sun 🙂 Pinned for when that time comes! Thanks Vivian! It’s so easy to make too. It was very warm today and it really was the perfect dessert to have.